In 2015, Maine holler-folk band The Ghost of Paul Revere laid claim to one of Tamworth’s first barrels of rye whiskey. After playing a show at our café, Tamworth Lyceum, the band paid a visit to the barrelhouse, where distillers just happened to be laying down a batch of 100% rye whiskey. They signed the barrel to stake their claim, and vowed to return in two years. Now in two years later, they’ve made good on that promise with an encore performance at the distillery in celebration of the whiskey’s release. 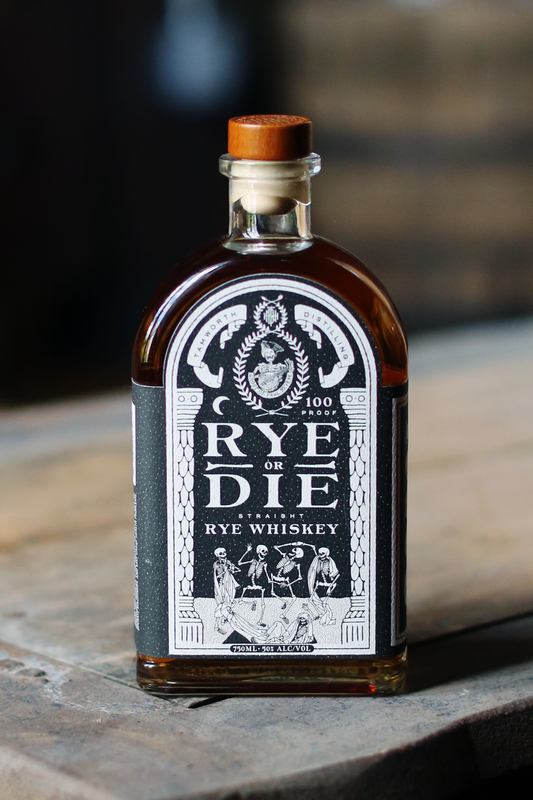 Rye or Die is a straight rye whiskey, made from a single crop of organic rye grain from Maine — coincidentally, the band’s home state. A portion of this crop went to maltsters in Massachusetts to be malted, and combined with the remaining raw rye grain for a 100% rye mash. As the distillery’s first batch of this kind, a ‘sweet mash’ was used, rather than the sour mash common in bourbon whiskey production. The result is a cherry-like nose and depth accented by the rye’s peppery kick. Smooth, hay-like notes open up as they warm on the tongue, joined by fruity sweetness reminiscent of apple and pear. This is an excellent sipping whiskey, with only a mild heat, light bitterness, and medium length finish.